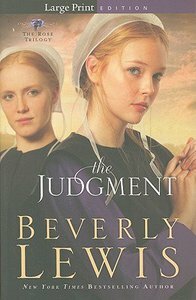 About "The Judgment (Large Print) (#02 in The Rose Trilogy Series)"
Customer Reviews For "The Judgment (Large Print) (#02 in The Rose Trilogy Series)"
The story of sisters Rose and Hen continues in Part Two of The Rose Trilogy. I love the wisdom of all those who advised Hen - the Bishop, her father - all prepared to honour her marriage to Brandon as sacred before God, even above her returning to the Old Order and their community. Such selflessness, such maturity, such wisdom. Beverly Lewis gives us such an intimate look into these people's lives -  it's as though we know them personally. We know their thoughts, feelings, hopes and dreams. We are part of the close community that works together, worships together and does everything together, sharing good times and bad. We delight when Pose finally realizes her heart belongs to Nick, but is it too late? Cant wait to read the final installment! The Judgement is a perfect sequel to the first book in the Rose Trilogy. Suspense and excitement are on each turn of the page. Follow Rose and Hen as they each live their separate lives and each struggle with different challenges. Rose struggles with the feelings of love while Hen struggles with her Amish heritage and modern husband. A fantastic read not to be passed up. The story of the Kauffman sisters reaches its climax in this rivetting conclusion to the Rose Trilogy. Hen cares for her injured husband, uncertain of what the future may hold. Rose welcomes a second chance at love when she least expects it. Is she finally able to give her whole heart? Lancaster County, with its rolling meadows and secret byways, may seem idyllic, but it is not without its thorns. The Rose Trilogy is the stirring saga of two Amish sisters, and the events and decisions that change their lives. Spirited Rose Ann Kauffman has long enjoyed a close friendship with the bishop's rebellious foster son. Rose's older sister, Hen--who knows more than she should about falling for the wrong man--cautions her against him, but Rose is being courted by another, and so dismisses the warnings.